Abdominal pain is a common complaint in children which has a vast differential diagnosis. Hip pain is also a nonspecific sign. Spider bite is one of the differential diagnoses. Since the time of Aristotle, spiders were known. One of the most dangerous types is black widow spider or Latrodectus tredecimguttatus. Typically, the female is larger and more dangerous than male. After a spider bite, sharp pain as a pinprick occurs in the bite site, and then the pain spreads contiguously, for example, from the hand to the arm. Other signs and symptoms include generalized myalgia, pain on the back, chest, and abdomen, and vomiting and head ache. In addition, muscle rigidity and cramp are common. Abdominal wall may be severe and may be confused with surgical problem, especially in children. Here, we present a case of a 3-year-old boy with a chief complaint of abdominal pain and pain on both hips, much on the right side, who was misdiagnosed at the beginning. A 3-year-old boy (from Torbat-e Jam, Khorasan, Iran) with a chief complaint of abdominal pain and pain in both hips, much on the right side, was presented to the Pediatric Emergency Department of Imam Reza Hospital in Mashhad, Iran. The patient was examined in the Pediatric Emergency Unit. He had mild fever and severe tremor, and on examination, abdominal distention and severe sweating were overtly observed. His vital signs were respiratory rate = 32/min, pulse rate = 89/min, blood pressure = 139/93 mmHg, and temperature = 36.8°C. The history was negative for trauma, use of drugs, previous diseases, or fever. The initial examination of the hip and abdomen had no important clinical symptoms except for abdominal distention. Generalized tremor and abdominal pain continued. Imaging was performed, and the chest and abdominal radiography showed generalized ileus. Sonography of the abdomen and hip was normal. Laboratory analysis was also performed, and the urine analysis was normal. 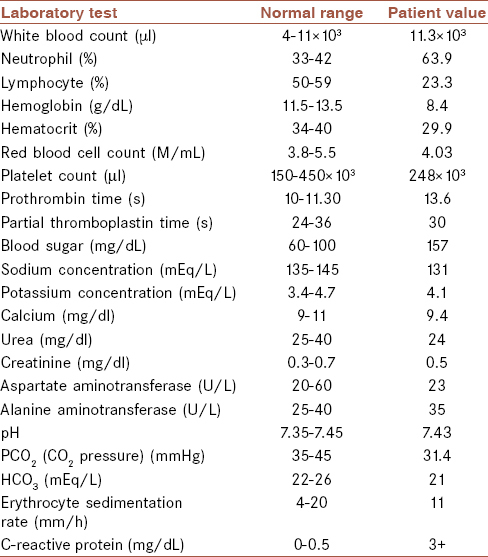 Further laboratory data are shown in [Table 1]. Given the high prevalence of Brucellosis More Details in Iran, an evaluation utilizing Wright and 2ME standard tests was performed which was negative. The abdominal pain continued, so abdominal sonography was performed and the result was normal. The imaging for kidney, urine, and bladder was normal too. Therefore, according to the laboratory data and imaging, several nondigestive causes of abdominal pain in children such as pneumonia, hydronephrosis, psoas abscess, pelvic osteomyelitis, and pyelonephritis were ruled out. Pediatric surgical consult was requested for the patient and the surgical problems were also ruled out. Due to the ongoing symptoms such as severe abdominal distention and tremor, a toxicology counseling was requested. On a second history taking from the parents, we found that the patient's father was a farmer and the boy was in the farm with his father prior to the onset of the symptoms. There was also a hesitant history of sudden burning sensation on the right malleoli, hence the diagnosis was made based on the history and symptoms as a spider bite. After the use of acetaminophen and midazolam with appropriate dose, pain was recovered, and the patient discharged without any complaint after 4 days. L. tredecimguttatus, also known as red back spider or black widow spider, has a neurotoxin named α-latrotoxin which triggers a cascade of events including intracellular activation and exocytosis of norepinephrine, dopamine, neuropeptides, acetylcholine, glutamate, and gamma-aminobutyric acid. According to numerous publications, following the widow spider (Latrodectus sp.) envenomation, local pain, erythema, abdominal pain, rigidity, hypertension, and diaphoresis can be observed., The regional lymph nodes often become swollen and tender within 30 min. General effects include nausea, vomiting, and sweating, but coma and respiratory failure scarcely happen. Based on a study conducted on this type of envenomation in children, during summer and afternoon, 74% were poisoned by the spider at home, and the anatomical areas mostly affected were arms, hands, and thorax. The common signs and symptoms in the infants were irritability, constant crying, hypersalivation, agitation, erythema on wounded areas, and seizures. Among elementary school children and teenagers, signs of envenomation included local pain in the envenomation area, abdominal and thoracic muscle spasms, fine tremor, and residual signs. Riley BD, Pizon AF. SNAKES and other reptiles. In: Nelson LS, Levin LA, Howland MA, Hoffman Rs, Goldfrank L R, Flomenbaum N, et al., editors. Goldfrank's Toxicologic Emergencies. 9th ed. Under the united state copyright: McGraw-Hill; 2011. p. 1562-3. Nordt SP, Clark RF, Lee A, Berk K, Lee Cantrell F. Examination of adverse events following black widow antivenom use in California. Clin Toxicol (Phila) 2012;50:70-3. Monzavi SM, Dadpour B, Afshari R. Snakebite management in Iran: Devising a protocol. J Res Med Sci 2014;19:153-63. Goel SC, Yabrodi M, Fortenberry J. Recognition and successful treatment of priapism and suspected black widow spider bite with antivenin. Pediatr Emerg Care 2014;30:723-4. Yaman M, Mete T, Ozer I, Yaman E, Beton O. Reversible myocarditis and pericarditis after black widow spider bite or Kounis syndrome? Case Rep Cardiol 2015;2015:768089. Levine M. Pediatric envenomations: Don't get bitten by an unclear plan of care. Pediatr Emerg Med Pract 2014;11:1-12.